If you’re on your way to a wet weather destination, like Scotland or Costa Rica, it’d be a good idea to pick up a packable rain jacket. A lightweight rain jacket is also a great item for your backpack on a hike, and we consider it essential. We understand the value of a packable rain jacket, something you can easily stow in a bag or backpack without feeling like you’ve crammed something the size of a sleeping bag in with your wallet and phone. Scouring rain jacket reviews online is time-consuming and can be a drag. We’ve taken the time out of the equation and hand-picked the best packable rain jackets on the market for travel and life. This rain jacket boasts pretty much any feature you could possibly need when the wet weather hits, so it’s no surprise it made the cut for best packable rain jackets. To make it only better is the tremendous value you get with this jacket as for the price you get a lot of rain jacket. It boasts some great features like a hood drawstring, fully-waterproof coated nylon fabric, and arm pit zips for ventilation. A slight hi-lo silhouette covers your back and allows for protection below a backpack on your waist. Deep front pockets with snap buttons are perfect for holding more than your average pockets (it’s nice to be able to keep your backpack where it belongs). It also comes in some nice color options. 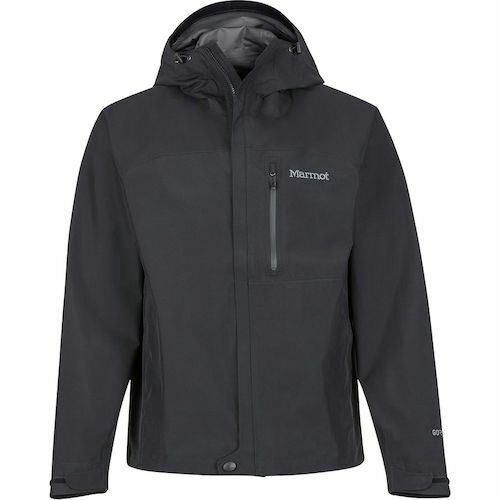 We’re giving this the top slot as Marmot makes a lot of great rain jacket and when it comes to packability, value, and function. Not everyone needs a rain jacket that will hold up to an ocean wave or down pour. This scratches that itch between wanting a cheap packable rain jacket and getting a quality piece of gear. We recommend a lot of REI products because they have yet to let us down. Their Drypoint GTX is a fantastic offering for those seeking a top of the line technical jacket that doesn’t totally break the bank, disclosure it’s still expensive. However, with this jacket you’re getting a tremendous value a waterproof/weatherproof shell jacket. The jacket shell is durable and holds up well agains the elements while the interior remains soft and dry. We like the features such as hand pockets, waist cinches, vents, a comfortable hood, and cuff adjustments. If you’re not an avid outdoor enthusiast don’t fret as this is a hybrid jacket that blends together elements for an everyday and technical hiking jacket. You’ll notice it mainly in the cut of the jacket. Most importantly is this jacket is lightweight and can easily roll up into the hood for travel days or riding in your daypack. There’s nothing like a good trench coat, and when you combine that with waterproof fabric, you’re left with a rain jacket that boasts double the awesome. Plus, with all the added features this jacket can offer, surprise rainfall is no big deal. Some of the features included made this option a no-brainer for our list of best packable rain jackets. A two-way zip with a panel protects the zipper from the elements. Princess seams run down the front and back of the jacket for a slimming fit that looks as good as it feels. Bonus: for windier, rain-free days where you don’t feel the need to break out the hood, you can easily remove it and stow it away. And finally: looking for something a little more fun than black? This jacket comes in five different colors. This jacket hits the mark right between entry-level rain jacket and top of the line to deliver a versatile rain jacket sure to keep your dry. When we first got our hands on this jacket from the level below the quality difference was vast. 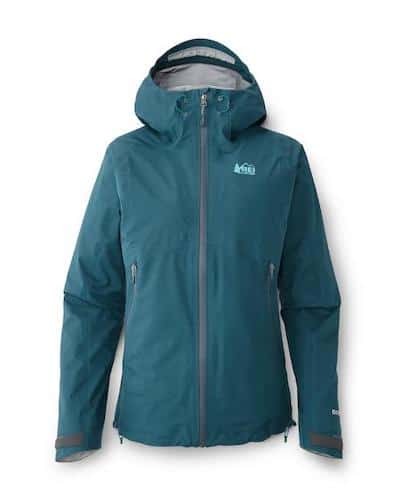 It’s close to a true shell jacket and the 2.5L Gore-Tex material feels durable and waterproof. It’s a great material that holds up the elements with the benefits of breathability. A jacket like this is for adventurers who will benefit from a jacket that is both waterproof and windproof. Coverage is good too as the jacket features a robust zipper, a thick, wrist straps, and hood waist and hood cinch. For the eco-conscious, the material Paclite Gore-Tex material is created with a recycled fabric face. To make the matter better if you order the jacket at the time of publishing this article it’s on sale. 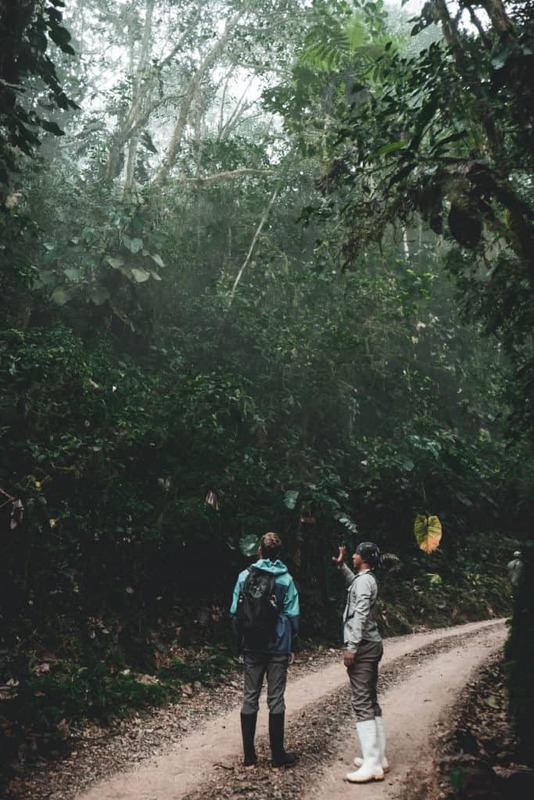 Making it an incredible value if you’re in the market for a quality piece of rain gear that will be great in the mountains, rainforests, or just around home. The negatives of this jacket include the lack of a stuff sack and heavy Gore-Tex material, that makes it not very packable despite its lightweight nature. Plus, not all travelers want a technical piece of hiking apparel for city hopping. 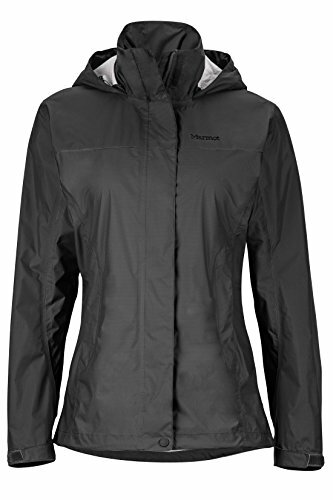 The Venture 2 Rain Jacket is a more robust North Face rain jacket for women. 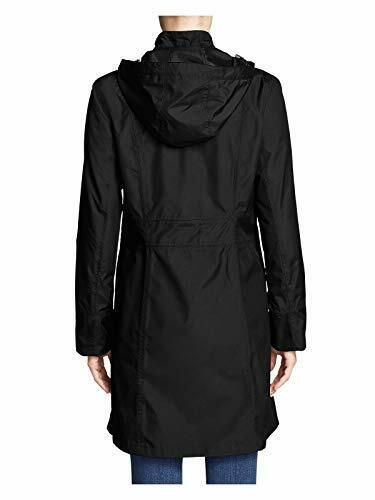 It’s made with a windproof and waterproof exterior fabric, added zipper paneling for extra coverage, and cuff and hem drawcords for cinching – just one more way to lock out bad weather. Nothing is getting in while you’re rocking this rain jacket. This lightweight rain jacket packs away neatly into its pocket for easy suitcase storage (or a backpack, if you’re not sure how the weather is going to turn out that day). Zippers have been added to the underarms to give the option for even further ventilation. Having a jacket that breathes is super important when you’re active outside and we’ve talked about breathable layers in our post about what to wear hiking. 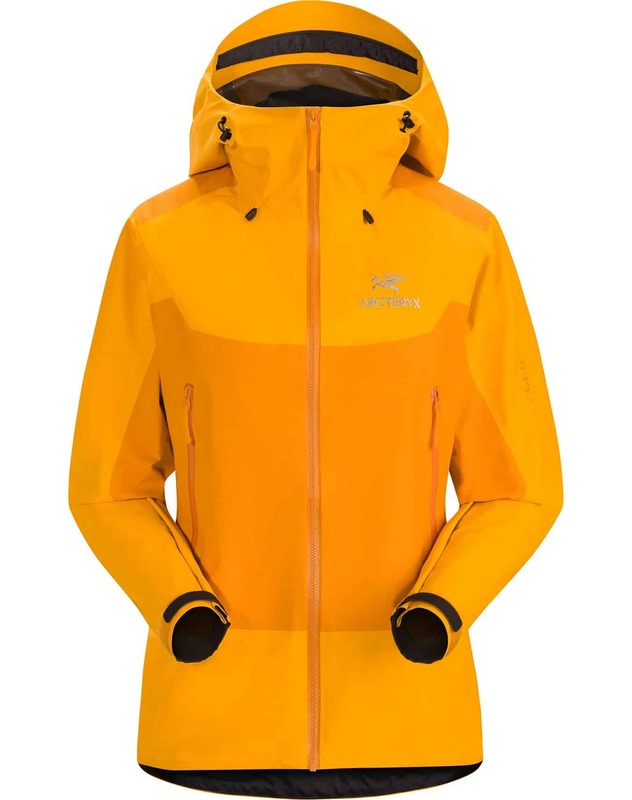 This lightweight packable rain jacket would be a great fit anyone who likes to spend time outdoors, but doesn’t feel like dropping the money on a high end brand name like Arcteryx. With great value and solid features it’s worth checking out plus we like the wide color selection. There’s nothing better than a rain jacket that’s so packable you don’t even know it’s there until you need it. Arcteryx’s reputation precedes it; with the features and mindful construction for which the brand is well-known, it’s no wonder that one of its women’s jackets ended up on our list of best packable rain jackets. Not only is this jacket waterproof and windproof, but it’s also snow-proof. Two layers of Gore-Tex finished with a durable, water repellent finish mean you stay toasty and dry. The rain jacket is packed with technology and specialty fabrics that make it a top of the line investment. It’s the top-rated jacket for weatherproofing so it will stand up to any harsh elements you may throw at it. More subtle details like the underarm gussets and the velcro cuff tighteners only make it easier to stay comfortable and keep the moisture locked out. Thanks to careful attention to fit (streamlined and flattering) and construction, this jacket is in equal parts practical and current – two things that will never go out of style. This is the best jacket on this list, but it also happens to be the most expensive by a good bit. If you have the money to spend and need a jacket that will hold up to the elements this is a solid choice. It’s hard to find a jacket that claims to do it all, but this option from KUHL is a pretty close fit. It’s got all the things we know you want and need your rain jacket to do: seam-sealed, fully waterproof and wind resistant fabric, a hydrophilic outer coating to repel moisture just that little bit extra, a two-way zipper for extra comfort, and hand warming pockets for the days you forgot to grab your gloves. But it does more than just that; style-wise, this is jacket is a steal. A subtle and streamlined shape will help make you feel stylish, with a dropped hem for more mid-thigh coverage. And if a straight or boxy silhouette isn’t what you’re feeling that day, then use the adjustable waist cords to tighten it above the hips for a balanced, more hourglass shape. It packs easily into its pocket for easy transport, so even if the weather tries to one-up you, you’ll always be prepared for a little unanticipated rainfall. This jacket is simple, lightweight, understated, and still does everything you need in an emergency rain jacket. The adjustable hood comes with a drawcord for windier days and it packs into its front-kangaroo pocket for making it lightweight and packable. The zippered pocket on the exterior of this kangaroo pocket is useful for things like transit tickets, your phone, or a little cash – things you don’t want to have to reach into your bag to find. With its pullover style and half-zip, elasticated cuffs, and slightly longer length, you’ll feel comfy and neatly tucked in, leaving wind and rain to stay where they belong – outside. 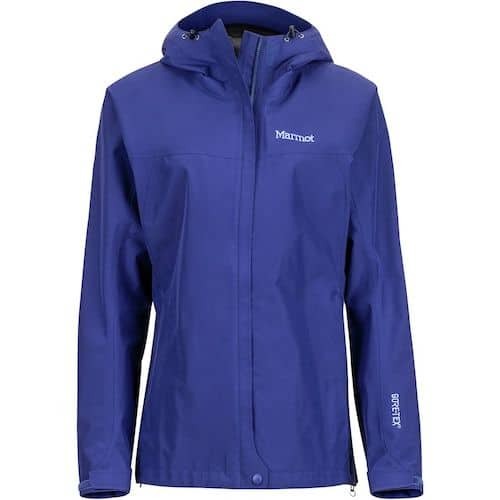 As its water resistant it is good for the occasional rain shower, but it’s more a wind breaker than a full rain jacket. It’s made the list for just how lightweight and stylish the jacket is rather than it’s superior weatherproof details. This one falls at the bottom of the list because it’s not technically a rain jacket. Another option from Eddie Bauer; but with the quality you know you’ll get, is it really a surprise that it’s included in our list of best packable rain jackets? 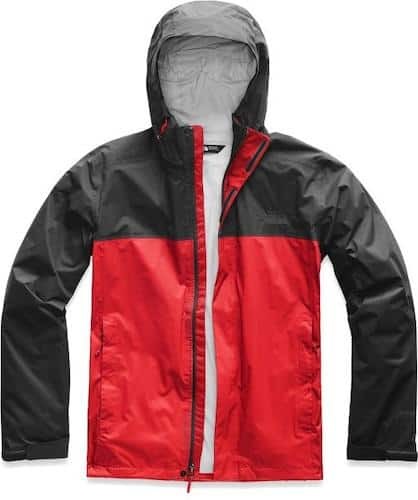 This super lightweight jacket is double-walled and fully seam-sealed jacket. 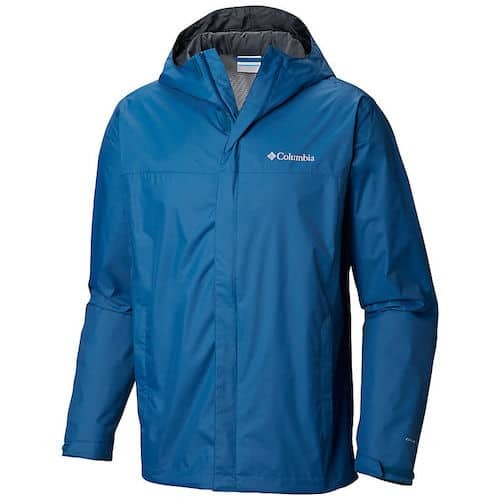 It’s a great option for rain protection and Eddie Bauer comes with a lifetime guarantee on their products. But aside from the basic things we know you need in a waterproof coat, this option offers other features that only raise the bar – a high neck to prevent your shirt getting wet; an interior mesh lining to keep you cool even when your pace picks up; an internal pocket to keep your phone extra safe and dry; exterior zip hand pockets; and a handy pint-sized carrying case for when you want to pack it up and stow it in a bag or suitcase. The fit sits halfway between a slim fit and relaxed, for something that leaves room for clothing and moves with you. Calling all eco-shoppers: this Patagonia packable rain jacket is made from 100% recycled nylon fabric. Fully waterproof, wind-sealed, and breathable, this jacket will be your best friend. Not only is the jacket packable, but so is the visor hood. When it’s not raining hard enough to need a little face awning, simply roll it up and tuck it into the stowaway compartment. The neck is also lined with microfleece, so staying toasty and comfortable is a guarantee. Lined pockets keep your hands toasty when you’re out and about, and velcroed cuffs help keep the cold from sneaking in the back door, so to speak. Zippered under-arms give you the option of airing yourself out when the going gets a little too warm, and several color options (many of them horizontally two-toned) means you can be a little more selective based on your personal preference. This is an excellent option for absolutely torrential downpours. Whether you use it for everyday travel or mountain trekking, it’s pretty much a promise that you’ll be as dry when you take it off as when you put it on. The interior is lined with mesh for easy circulation and zero overheating, and the visored storm hood means that even in the heaviest rain you’ve ever seen, nothing is getting in. Take that, rain. The longline silhouette with the drop tail makes for seat coverage (we’ve all sat on wet bus benches before), while the hem drawcord means you can adjust the tightness of the hem around your hips. Added features like a chin guard to resist the zipper-to-chin chafing and zipper paneling just add even more resistance to the elements. When you’re ready to pack it, simply stuff it into the exterior pocket – it’s its own carry-case. Aside from the range of colors, this jacket is also available in plus sizing and even a “tall” option for those who need a little more room. North Face is another brand where you really can’t go wrong – a really safe bet for everything from quality and construction to effectiveness. 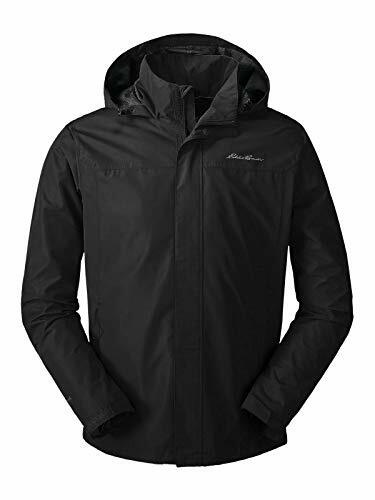 The Men’s Tall Venture 2 Rain Jacket is another such raincoat, made with a windproof and waterproof exterior fabric, added zipper paneling for extra coverage, and cuff and hem drawcords for cinching – just one more way to lock out bad weather. Nothing is getting in while you’re rocking this rain jacket. Just like the Columbia men’s jacket, this one packs away neatly into its pocket for easy suitcase storage (or a backpack, if you’re not sure how the weather is going to turn out that day). Zippers have been added to the underarms to give the option for even further ventilation, especially when walking in the rain can often make you just a pinch sweatier. The fit is tall and relaxed, so more options for clothing to maximize your comfort. When it comes to rain jackets, particularly those made for wetter climates, style is always an issue. It’s pretty easy to start to dislike a particular coat because while functional, it just doesn’t have any kind of style or look to it. We’ve kept this list of jackets narrowed to options that give you a certain versatility but also a sleek and understated look so that you won’t feel clunky, boxy, or out of place. Plus, something you’ll be happy to wear when you’re back home, on your way to work, or just out and about on your day off. We’ve all been victim to buying high-priced clothing with low-end quality, where the item just doesn’t deserve its high price tag. We wouldn’t wish that on anyone, so the following list includes brands known for the quality of their goods, starting with the fabric and construction. We’re talking double-walled, Gore-Tex, totally waterproof and ready to withstand pretty much anything you throw at it. Because when you buy something you know you’ll need long term (the weather isn’t likely to get any different over time! ), you want to feel like you’ve put your money towards something you don’t need to worry about replacing for years to come. There are a number of features we know you need in a raincoat: waterproof, wind-resistant (sometimes, that can make you colder than the rain! ), durable, pocketed. But there are other features that you might not always consider when mulling over a rain jacket purchase: a drawstring hood, buttons vs. zipper, hanger loops, zipper flaps, and more. 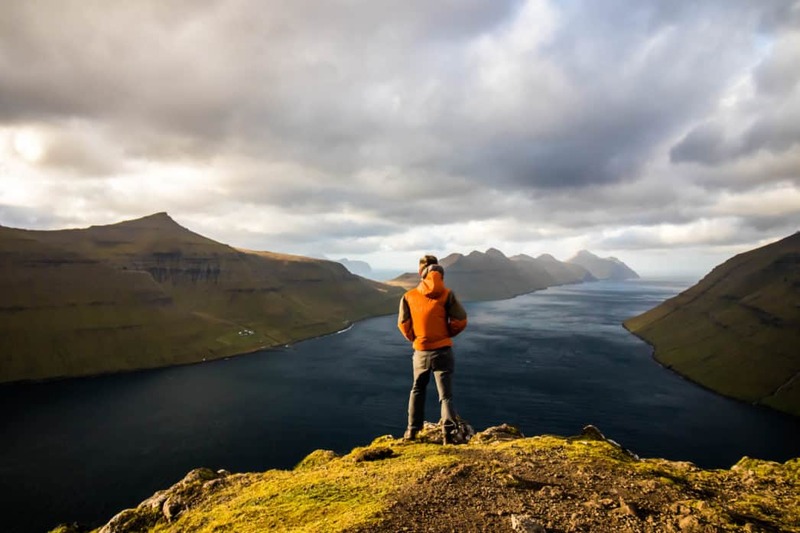 This list of best packable rain jackets all have a multitude of features to give each option a little something extra, for a coat, you’ll feel all that much better about investing in – and that can continue serving its purpose long after you return home.